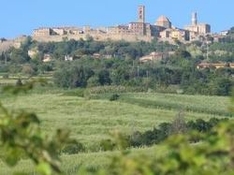 Old Volterra invites to the festival of flags “Astiludio” on the first Sunday of September. The colorful festival alludes to the historic events of the XV century. On the 18th of October 1406 two couriers arrived in Volterra with the news that the Florentine troops had triumphed over the Pisans a couple of days before, on the 9th of October. At that time Volterra was an ally of Florence, so the news was taken jubilantly. The couriers were generously rewarded. Scarlet, black and gold remnants were presented to them. They were enough to make new horsecloths and clothing. A grand feast was organized in honor of the good news. The festive table occupied the central square; wine barrels were everywhere. The performance of young standard bearers culminated the feast. The name of the feast originated from the word «Astiludium». It consists of two words in Medieval Latin: hasta meaning “flag” and ludus meaning “game, festival”. The modern festival has a little bit changed name «Astiludio». All chime bells of Volterra announce the beginning of the festival at 15.15 sharp on the first Sunday of September. Right at this moment processions start moving from four town gates to meet on the central square and start the tournament. Accompanied by drums and pipes, multicolor flags flutter above old Volterra making the feeling of flight. The audience, including townsfolk dressed in outfits of knights and ladies, merchants and craftsmen welcome standard bearers with cheerful shouting. Volterra turns into a medieval town full of joy from happy news once again. The winning team of standard bearers gets the prize named “Bravio”. It is an alabaster board created by experienced local craftsmen. Alabaster is a traditional material of Volterra craftsmen. The prize “Bravio” is always a unique work of art which reflects experience and traditions of the local area. Volterra is a small town with rich history which goes back almost by three thousand years. The early stage of town development is connected with Etruscans. Now we may see the evidence of their presence not only in the richest museums but also in the town itself. Today you may pass through the famous Porto del Acro, which contain the image of three Etruscan gods and walk around Fortezza which embraces the town centre and seems to be endless. The grand tower above the cliff functions as jail till present days and surprisingly is not presented to tourists. Although in the very centre on the top of the hill you may observe the excavation of the Etruscan necropolis.